Jesus healed many people when He walked on earth. Because He told us to heal the sick the Christian church has been involved in healing since it started almost two millennia ago (see Acts of the Apostles chapter 3). What is healing? What does it mean to be well and whole? It is being made whole - physically, spiritually and emotionally. We may be physically 100% fit but we can suffer from emotional depression, or we may be emotionally well balanced but physically ill. Then again it is possible to be physically and emotionally well but if you don't know the purpose of life, chances are, you will be ill at ease with yourself and life. Now if for instance we have cancer, we will ideally want to be healed in all of the above areas. Should we not be physically healed of the cancerous cells, we will need to come to terms with the illness and spiritually find peace with God. Then when we come to the point of dying we can face it well and hold on to a real and genuine hope. Christian healing is interested in the whole person and is a form of holistic healing. We see the person as a physical and emotional and spiritual person. We are indeed fearfully and wonderfully made (Psalm 139). Healing: What does the church offer? Sunday by Sunday at the 10am service healing prayer is offered by trained prayer ministry team members at the close of the service. Bi-monthly "Healing and Wholeness" Service on the 1st Sunday of the month at 7pm. Contact the Rector if you would like to speak to a trained pastoral helper who will be happy to pray with you, listen and advise. Our source of power, hope and comfort is Almighty God, who loves us incredibly. "I am the Lord who heals you" Exodus chapter 15 verse 26. You may be interested to know that there is a prayer line run by UCB (United Christian Broadcasters) available between 9am and 10:30pm Monday to Friday. All calls are treated confidentially by trained volunteers. 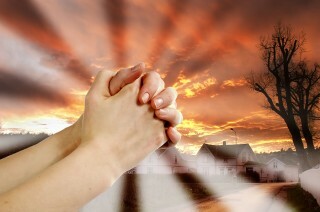 Contact UCB on www.ucb.co.uk or phone 0845 4567729 to ask for prayer.